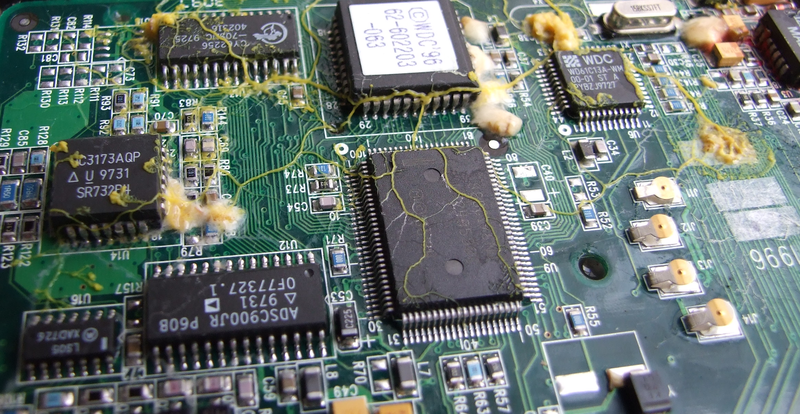 The yellow blobs of slime mold normally grow in dark forests, not on computer chips or on gelatinous squares shaped like the United States. But through his research, University of the West of England professor Andrew Adamatzky has shown that the mold can, and should, be grown elsewhere because of its potential in computing. Physarum polycephalum is a brainless mold that’s sole purpose is to build transportation networks for the nutrients that sustain it. As it expands in search of food, it sends out slimy tubes that continue to branch out until it finds a food source, at which point it forms a blob around the nutrients. Its slime tubes then continue to grow and split until the mold forms a network of tubes to transport the food throughout itself. The key to Physarum polycephalum’s computing power, however, is its ability to form the most efficient and optimal network. Adamatzky first used the slime mold to map British motorways in 2009 — showing that the M6/M74 should’ve been routed through Newcastle (if the mold was the designer). In 2010, Japanese scientists also proved that the slime mold could be used to model the rail system in Tokyo. Since then, Adamatzky has used the mold’s networking ability to model transportation networks throughout the world, and also bring the mold into the world of computing. To create the models — in this case for the U.S. — Adamatzky placed oat flakes on the 20 most populated urban areas and then started the slime mold in New York. You can watch below as the mold spreads itself over the agar, a gelatinous substance derived from algae that is commonly used in science labs, in search of food. While the video shows it happening in 46 seconds, the mold actually takes between three to seven days to form its network on about 4 inches of agar. It turns out that the slime mold agreed with most of the nation’s interstates. 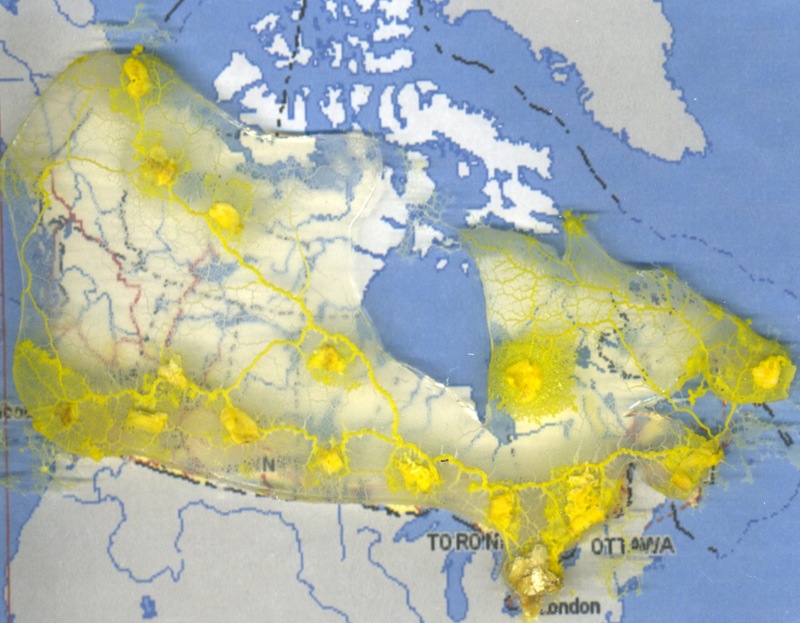 “We found that interstates 10 and 20 are responsible, at least from the slime mold’s ‘point of view’, for connectivity of the USA transport network: when these interstates are removed, the network becomes separated into western and eastern components,” Adamatzky said. 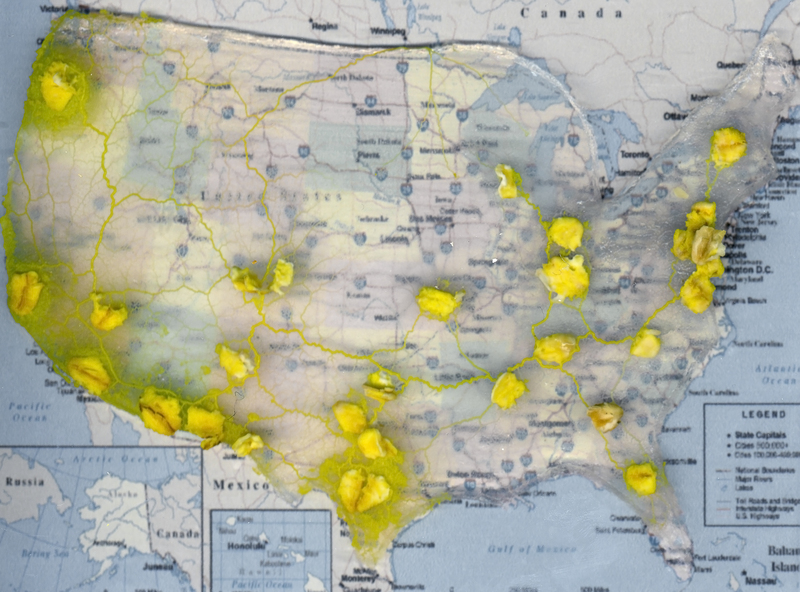 Physarum polycephalum, a type of slime mold, creates an optimized model of the U.S. interstate system. Photo from: Adamatzky A., Ilachinski A. Slime Mold Imitates the United States Interstate System. Complex Systems 21 (2012) 1-20. Because it’s a self-repairing, living creature, it can also model emergency situations. So if a road was cut off due to flooding or an accident, the mold could also be suddenly cut off at that point and its resources redirected in another optimal way. “By understanding how living creatures build transport networks, an urban planner would probably modify their approaches towards urban development and road planning,” Adamatzky said. And while we may not see a petri dish of slime mold on an urban planner’s desk anytime soon, there are more practical applications of the mold when it comes to computing. Adamatzky wrote a book in 2010 where he defined the concept of Physarum machines: programmable, amorphous, living computing devices. Because the mold is sensitive to light and certain chemicals, the mold can be programmed to travel certain ways while still finding the optimal network. The network, like the transportation model one, isn’t limited only to nutrients. Adamtzky and fellow researcher Theresa Schubert have shown that the slime mold tubes can carry dyes and even conduct electricity. The mold acts like self-mapping circuits, complete with logic gates where the slime mold is forced to make a decision to get one result. It’s the same way a computer does logic, by taking an input and creating an output. In the case of slime mold, the logic gates can even be used to separate two colors of dye within the system before combining the two as a single output. Another use for slime mold would be turning it into microfluidic devices, which manipulate liquids on a very small scale and are used for things like delivering controlled-release drugs. “Indeed slime mold can transport only bio-compatible substances, but even with such limitations, microfluidic devices made of slime mold would find some applications in, for example, biological sensors or lab-on-chips,” Adamatzky said. In their most recent study published last week in Materials Today, the pair showed how the network can be manipulated to form logic circuits that don’t need electricity, are very simple and inexpensive to reproduce. Since the slime mold computers are self-growing and self-repairing, they could be used in anything from soft-bodied robots to hybrid wetware like devices used to detect certain molecules. “Ultimately, we can make an all-soft, self-growing and self-repairing computing device from the slime mold,” Adamatzky said. Correction: The article was updated April 5 to reflect that Adamatzky first published a paper in 2009 detailing the use of slime mold to map British motorways. Back in the early 60s I read of microfluidic devices that were designed as control circuits for rockets. At the time they were the equal of electronics! Maybe it’s time to look back on some early designs to see if they offer some insights we can use now. As a Zerg player, this pleases me. It would be interesting to see if it were possible to mimmic terrain with analogous features on the surface of â€” say â€” the map of the USA, to see if the slime avoids steep elevation changes between the peaks and troughs, like mountains and valleys. This is amazing, the entire Interstate system could have been designed in a matter of a week at very little cost vs. the actual way it was designed after WWII. Think of what this means for future complex design decisions.